dressed up like a lady: Wool blanket. I mean skirt. Wool blanket. I mean skirt. This snowpocalypse thing is no joke. It's -15°F/-26°C as I write this! I've been wearing my giant sweater coat over variations on this outfit a lot. Wearing a wool skirt this heavy is not unlike going around with a wool blanket on your lap. I am just so in love with this outfit! Those shoes might actually be my favorite part. 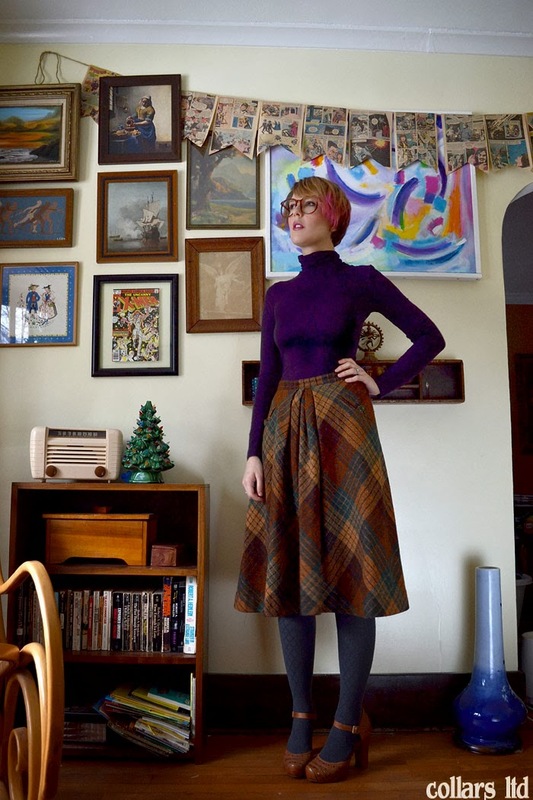 I give you major kudos for wearing a skirt, heavy wool or not! I'm loving the current term for Chicago during this weather: Chiberia. I love how color coordinated this outfit is; I am a bit of an obsessive color-matcher. 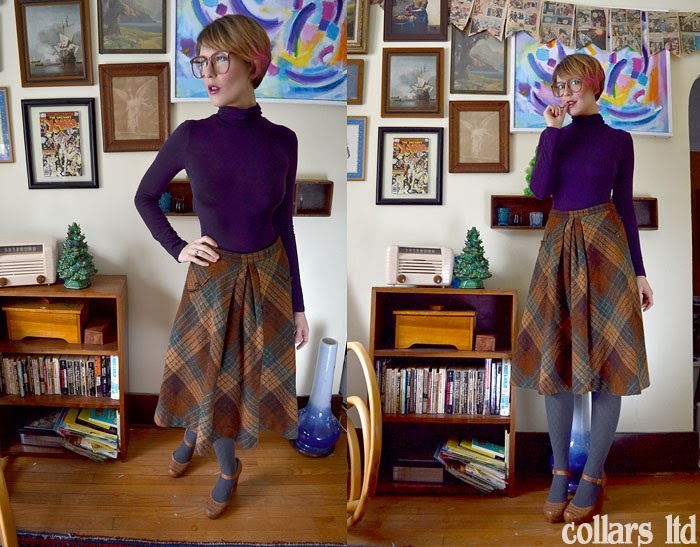 I realized just how much I loved this outfit when I found myself scouring eBay for the "perfect" long plaid wool skirt. There is NO higher compliment than that! Thanks, Alana! C'mon....in Poland where I live -26 C is like nothing...We used to have temperatures like this every winter. Last year we had snow in late april :) You can do it! I mean...you have a great skirt! Happy New Year!! all the best for 2014! Love the skirt...and I have the same ceramic tree, my mom used to paint them back in the 80's in ceramic classes. Just can't find the little bulbs as there are a few missing. 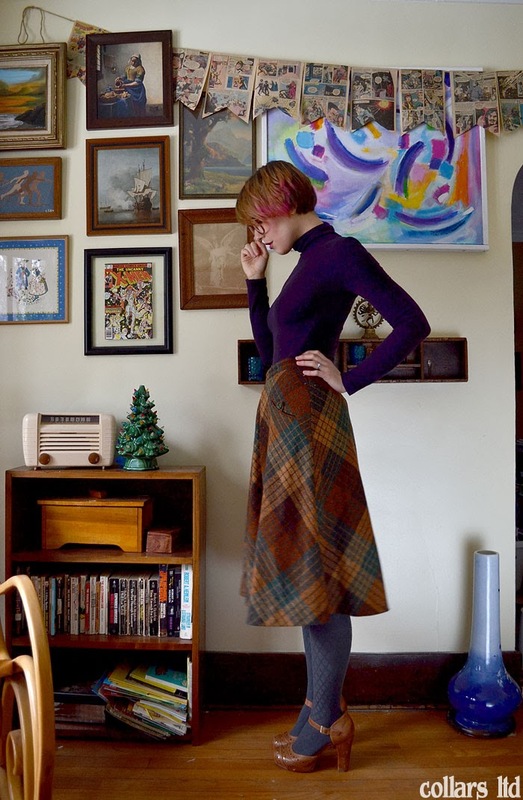 The shoes and the skirt with the tights are in such color-harmony, I love this outfit! The glasses remind me of Jamie Lee Curtis in a good way. :) Stay warm, kids!! I just love this pair of glasses on you! And I have been reading about the "snowpocalypse" and can't even begin to imagine what it must be like. I have never been in below 5°C all my life.. and that is cold enough for me. So -26°C I don't know how your nation is surviving! Hopefully it gets better!